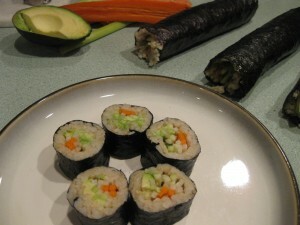 In my perennial quest to find creative ways to eat more veggies, I have found a fantastic dish: Nori Sushi Rolls. This may sound very exotic but fear not: they are super simple to make. And don’t be afraid of “nori”. Yes, it’s seaweed, but it tastes way better than you might imagine. Don’t believe me? Try them yourself! Cook rice according to package instructions. Add rice wine vinegar and sugar. Slice vegetables. Assembly: lay nori paper on dry surface on top of 2 paper towels. Spread 1/4 cup rice evenly on bottom two thirds of nori sheet. Layer carrot, zucchini, radish, and avocado evenly and begin to roll up from bottom. Let rolls rest 15 minutes then slice with a sharp knife and serve with light soy sauce for dipping. My kids roll these all the time!! Super easy and very delicious! Does anyone know of an alternative to soy sauce (because of a severe MSG allergy)?